South Luangwa National Park in eastern Zambia, the southernmost of three national parks in the valley of the Luangwa River, is a world-renowned wildlife haven. 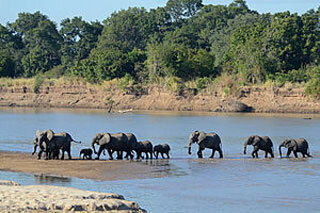 Concentrations of game along the meandering Luangwa River and its lagoons are amongst the most intense in Africa. The river teems with hippo and crocodile and provides a lifeline for one of the greatest diversities of habitat and wildlife, supporting more than 60 species of mammals and over 400 species of birds. This article uses material from the Wikipedia article "South Luangwa National Park", which is released under the Creative Commons Attribution-Share-Alike 3.0 License.